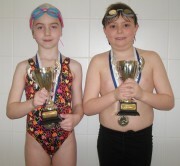 Katherine & Kai have both achieved their first Regional times. Congratulations! January 2013 Excellent attendance and outstanding effort in training! December 2012. Great attendance and attitude towards learning, improvement in strokes in the last few months. November 2012. Great attitude and attendance. October 2012. Amazing achievement of swimming the channel. September 2012. Great attitude and effort. July 2012: Attendance and improvement.